The freelancer market is maturing and businesses no longer have any misgivings about hiring someone from this workforce. 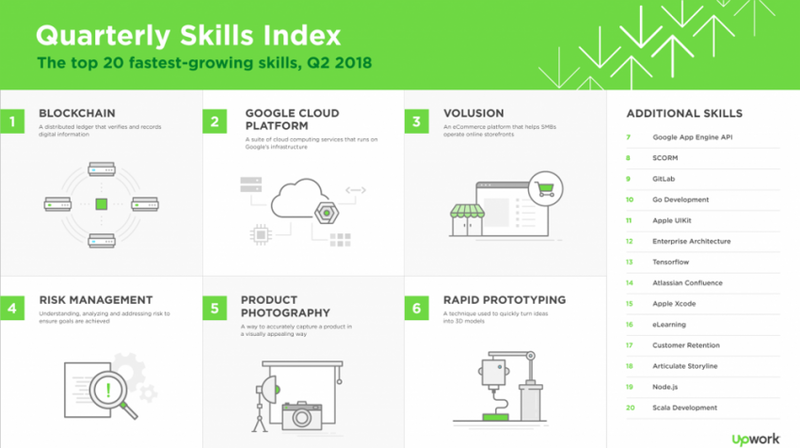 The Q2 2018 Skills Index from Upwork has revealed the skill sets for freelancers are now more diversified and they are highly proficient. UpWork Blog managing editor Amy Sept writes, “The Upwork Skills Index sheds light on new and emerging skills and provides real-time validation of current trends in the labor market and tech industry.” This has led more than half or 59% of HR managers to use freelancer in 2017, and 57% said they are going to use even more freelancers in the coming decade. For small businesses, the talent pool and the available skill sets mean they can afford to contract professionals for single projects without hiring someone full time. This gives owners the ability to temporarily acquire the services of highly talented individuals so they can compete in the marketplace and grow. Stephane Kasriel, CEO of Upwork and co-chair of the World Economic Forum’s Council on the Future of Gender, Education and Work, explains the importance of freelancers in a rapidly changing world. In Upwork’s 2017 top 20 freelance jobs, 16 of the top positions were technology related, and the latest list is also dominated by technology. In the second quarter of 2018, skills in blockchain retained the number one position from the first quarter with a 2,000% growth year-over-year and 3,500% year over year growth in the second quarter. Skills in Google Cloud Platform were second, followed by skills in Volusion (an ecommerce website builder), risk management and product photography, rounding out the top five. Skills in the growing area of rapid prototyping associated with 3D printing came in at number six. And as the price of the printers keeps going down and different filaments can be used, such as metals, it will provide a great opportunity for freelancers with these skills. Other skills in eCommerce, Google development and product integration also made the list. As workers evaluate their skill set in a changing technological environment, eLearning solutions are becoming more valuable too. If you are a freelancer looking to improve your skill sets, Upwork has created a list of relevant courses by some online providers which correspond to the list of skill sets in growing demand.